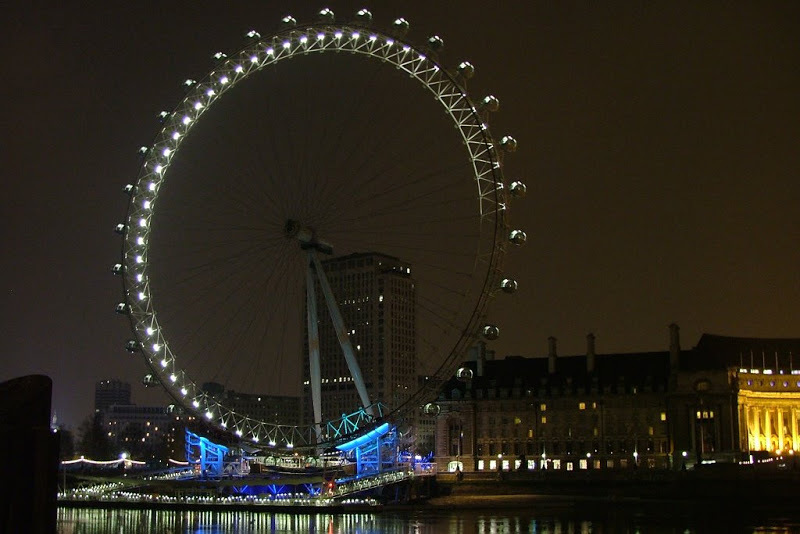 I'm looking for places in London which provide a good vantage point for taking panoramic photos at night. This implies that they should provide a panoramic view of the city center, be accessible till midnight and that setting up a small tripod should be ok.
One place coming to my mind is the Greenwich observatory, but I cannot determine whether you can still get to a good vantage point after hours or if they close everything off. A couple of places spring to mind. From around Greenwich observatory is one of them. You don't need to get inside the observatory. If you arrive to the Cutty Sark DLR station and then walk from there to the observatory, you'll be climbing up a steep incline toward it - from that path you get a really nice view of the city. The problem though is that you'd need to go through Greenwich Park to get there - and the Park closes at 21:30. 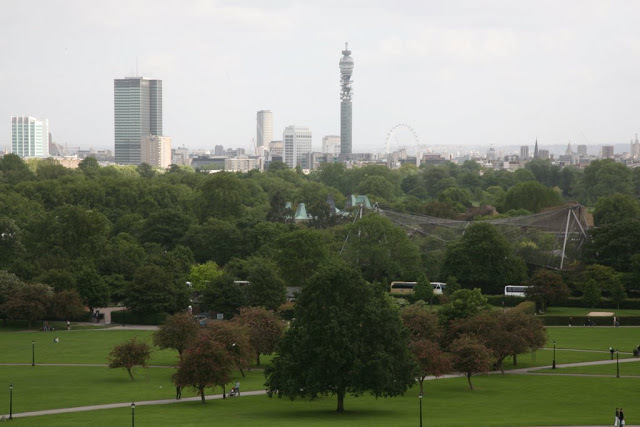 The other place (one of my favourite) is from the top of the Primrose Hill. It's just to the north of the London Zoo, but still affords a great view. It's an open space, you can go there whenever you please and I've seen plenty of people with tripods there. 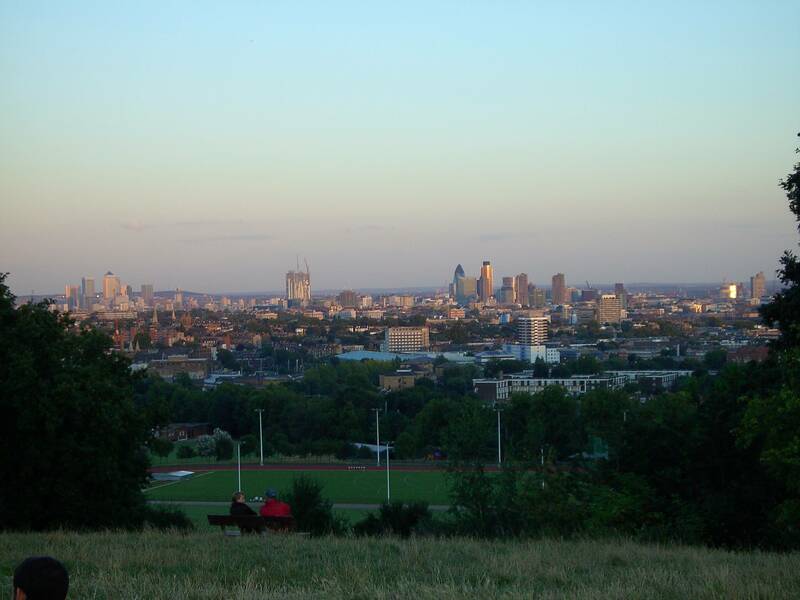 Here's a picture I took about 7 or 8 years ago from Primrose Hill - it's not the best, but does show some of what you can see. This is facing roughly toward the "middle" - you can see all the way east to Canary Wharf and beyond and all the way west to almost the Thames Estuary. Finally, a very nice place is the Jubilee bridge. It's actually three bridges: Hungerford railway bridge in the middle with two pedestrian Golden Jubilee bridges on two sides. 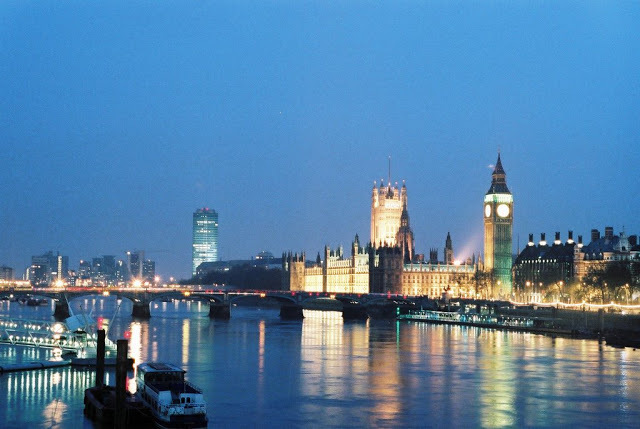 Walk on the Western one to get a great view of Parliament, Big Ben Tower, London Eye, etc. Walk on the Eastern one to get the view to the east, including part of the Canary Wharf. Here are a couple of my photos from the bridge, facing West. However you might not want to be on Hampstead Heath at night on your own with expensive photographic equipment. One of my favourites and a little known spot is The Point. It is a small park near Greenwich Park, but on the western edge of that ridge so gives fantastic views towards central London over the rooftops of Deptford. From there you can just about make out Battersea Power Station in the east, though you do not get a clear shot of it, but then a practically unobstructed view all the way around to the skyscrapers of the Docklands. With a long lens you can get decent shots of the central London Skyline, and assemble a panorama from them, but with a wider lens you can have a lot of fun with the context of south east London in the foreground. As a small local park it does not close, and though a little way out is accessible by the number 53 bus which runs 24-hours between Lambeth North and Plumstead, connecting with the DLR at Deptford Bridge, the Overground at New Cross, and Underground from Elephant & Castle. The nearest railway station is Greenwich about fifteen minutes walk away. But being downhill it is better for leaving than arriving when you have a bag of gear and a tripod, so the bus is better. The 53 bus also serves Woolwich, where if you walk along the river towards Charlton you can get some great shots combining the Thames Barrier, the O2 Dome, and Canary Wharf. Combining the two can make for a fun evening. Not the answer you're looking for? Browse other questions tagged london photography vantage-points or ask your own question.